A MUST SEE!! SPECTACULAR MODEL PERFECT POOL/SPA HOME WITH PANORAMIC VIEWS TO CATALINA ON A VERY PRIVATE LOT!! LOW TAX RATE NO MELLO ROOS!! Great for entertaining. Located at the end of a private cul-de-sac. 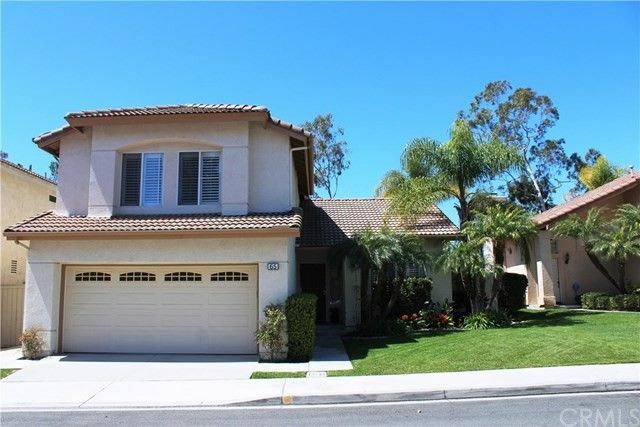 Beautiful custom upgrades through out this 4 bedroom 2.5 bath spacious home. Light and bright Kitchen includes custom euro white cabinets, granite counter tops, newer appliances and recessed lights. Separate breakfast nook w/ ceiling fan. Open family room includes a custom built-in media center with storage, custom fireplace with mantel, crown molding and recessed lighting. Formal living rm & dining rm includes planation shutters, ceiling fan, custom media center with storage & recessed lights. Flooring includes wood floors, ceramic tile with inserts, and upgraded carpet. Oversize master bedroom with plantation shutters, ceiling fan and panoramic views to catalina. Very private yard with a beautiful pool & spa. Large custom retractable awning. professional hardscape and landscape front & back. 2 car attached garage with storage, work bench & extra lighting & outlets. Close to schools, parks, community club house with pool, foothill Ranch Library, shopping, entertainment, 241 toll road & Whiting ranch wilderness park.